If you’re a pizza freak…. Is $72 too much to pay for perfection? I don’t think so, for I have achieved pizza perfection with The Baking Steel. 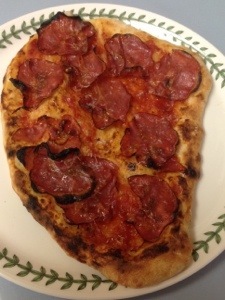 A while back, I wrote about my adventures in sheet-steel pizza cooking. After using the sheet steel a few times, I went back to my stone-plus-broiler method because my piece of scrap steel was too oddly shaped for cooking (long and narrow–not a suitable shape for cooking round pies). Meanwhile, I continued to lust after wood-fired pizza ovens (like this neapolitan oven from Breadstone), deterred only by the multi-thousand dollar price tag and expensive delivery charges. Here’s how it works: the 15-lb steel sheet preheats at 550 for 30-45 minutes. Next, the oven’s broiler is switched on high, blasting the steel with extra heat. Meanwhile, the cook preps the pizza. Within 20 minutes, the steel reaches 700+ degrees (yes, I checked it with my infrared thermometer), and a pie will cook about 3 minutes. The photos above show the (half anchovy/red pepper, half ricotta/parmesan/red pepper/black olive) pizza prior to cooking, at 30 seconds, at 1.5 minutes, and done at 3.5 minutes. Notice the lovely spots underneath, as well as the charred bubbling on top. The Baking Steel is worth every penny. See what others are saying about it: Kenji over at Slice, Rene at Blackened Out, and The Kitchn. Buy one for yourself and thank me later. Thank you for sharing your Baking Steel experience with your readers. I love your story, and your pizza’s are magnificent. Beautiful photos and spot on charring! It’s a great product….and it’s also great that your company makes a contribution to the food bank with each purchase. Not about pizza, but on a previous post. Tuesday Mornings on the west bank by Home Depot has Taralli. How odd! I never in a million years would have looked for taralli at a Tuesday Morning discount store in Gretna. Don’t you just love globalization? Thanks for the tip. That is some serious transfer of energy! I don’t think $72 is too much.